You are here: Home / EU - Regulating Biking / EU BANS Bikes? A couple of months back, we at Right To Ride wrote to José Manuel Barroso, President of the European Commission regarding the European Commission’s proposal – Approval and market surveillance of two – or three-wheel vehicles and quadricycles. At that time the European Commission’s proposal was being discussed within the IMCO Internal Market and Consumer Protection (IMCO) European Parliament committee of MEPs, riders in the UK and Ireland riders had held demonstrations against the Commission’s proposal. A demonstration by Motorcycle News (MCN), a UK weekly motorcycle publication, was also planned to ride to Brussels – which took place in November against the proposal. There was a lot of angst amongst riders in the UK, regarding issues surrounding the proposal on the internet, especially on social networking pages – forums and in the motorcycle press. Equally, there was misunderstanding amongst riders of what was contained in the proposal, many believed (and still believe) that the Commission’s proposal included the banning of filtering through traffic, banning motorcycles over 7yrs old in Urban areas and the compulsory wearing of Hi-Viz clothing. 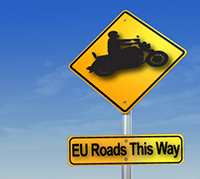 Most of this angst surfaced as anti-European Union rhetoric that the proposal was part of the EU’s attempts to completely remove motorcyclists from EU roads – there was concern that the EU was trying to ban bikes! We pointed out in our letter, that while we appreciated that there are a lot of important issues being dealt with by the European Commission, these motorcycle issues are just as important to motorcyclists here in Northern Ireland (31,250 approx. ), Ireland (36,000 approx. ), Great Britain (1.5million approx.) and indeed throughout the whole of Europe (33.5 million approx.). We called for clarification from the Commission that would allay the fears of the European Motorcycle Citizen. We asked for a statement that the European Commission is not attempting to completely remove motorcyclists from EU roads and asked what the Commission’s position regarding motorcycles (Powered Two Wheeler – PTW – Mopeds – Scooters – Motorcycles) is. 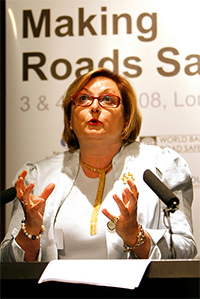 We have now received a detailed reply which was filtered down to the Head of Unit for Road Safety at the European Commission, Isabelle Kardacz who replied to us on behalf of the President of the Commission. Her reply was to the point. She stated “Let me make it very clear that the Commission’s position concerning the use of motorcycles and mopeds is not, and has never been, to ‘remove motorcyclist from EU roads’. “As you are certainly aware of, accident statistics show that motorcycle users have a risk of dying or being seriously injured greater than users of four wheel vehicles. And this is also the case for cyclists and pedestrians. This greater risk is certainly related to the fact that these road users are not protected by the vehicle and therefore are more vulnerable in case of an accident. This is why the Commission has set as a priority for its action to improve road safety for motorcyclists and other vulnerable road users. EU action on road safety aims at reducing the high number of casualties or fatalities, which result in so much suffering and represent such an important economic cost. For this, a variety of measures have been adopted and more will follow in the future. This was the Commission’s response to our questions. 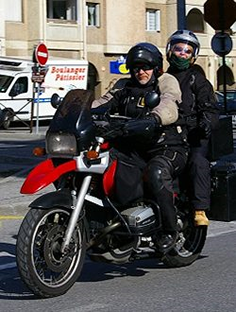 Whether you disagree with this response or try to analyse the reply, or read between any unwritten lines, the EU Commission states that its position concerning the use of motorcycles and mopeds has never been and is not to remove motorcyclist from EU roads, nor has been oriented towards limiting the use of motorcycles. @ Dave: I can’t fault your grammar…. Motorcycles are the most effective method we have of ridding society of the kind of social and intellectual cretins that ride them. From the vile unwashed leather waist-coated overweight bearded outlaw types who believe they are a law unto themselves, to the compulsive obsessives suffering from arrested development who ride everywhere at 160 mph and make my life a living hell at weekends and during the summer months. The burden on the tax payer for providing those ridiculous air ambulances and ER facilities for these suicide jockeys who regularly scatter themselves along the A361 here is clear proof of the ‘breed apart’ mentality of these people. 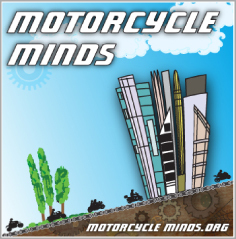 More middle aged men kill themselves on motorcycles than any other demographic. If only they could do it younger and rid us of the interim years of insanity they impose upon us, the majority. Motorcycles are the most absurd and pointless contraption mankind has ever devised. The only good thing about them is that they keep the crematoriums and funeral directors in regular work. Don’t just ban motorcycles, ban the odious low IQ oiks that ride them too. I think the above shows the mindset of the body of the EU.. The blame for accidents is laid at the feet of the riders of motorcycles,scooters etc..
For far to long we as two and three wheeled users have been perceved as the people to blame.. The stats prove otherwise and the EU manderians need to get there head out of the sand..
Their agenda is that “They” want us to wear yellow shirts on Tuesdays and only eat bland cheese on white bread….. Do you realise what you have written? This is not 1984, Communism was defeated – much to my disappointment, because it was far better when “They” had that hermetic seal around countries like Bulgaria, Russia and Albania – to keep the riff raff in. With regards to the North (of Europe) versus the South, all these countries are part of the European Union so unless “they” decide to split it into two parts, the rules for the south are the same as the rules for the north. With regards to the Outlaw clubs strengthening “their” views….hmmmm those same clubs that took part in Her Majesty’s Jubilee celebrations? But my question is – who are “They”? In reference to the use of motorcycles during the war, both my parents were in the armed services, my father and both grandfathers saw active duty, but that war ended 66 years ago, the Germans are now our allies, so I’m sorry I don’t see the connection. Motorcycles were used during the war, along with jeeps, horses and even dogs, so what? Things evolve, forms of transport evolve, jeeps have evolved into the most popular form or four wheeled transport i.e. 4x4s, the simple motorcycle used during the war has evolved as well – but what has that got to do with freedom of choice? Sorry, but all this conspiracy theory is doing my head in, I do not believe that the European Commission has any intentions of banning a specific mode of transport – used by 33 million people, I do believe that the Commission may try to change aspects of it, whether that is for the better or not, is to be determined, as far as I can see, this is why we need to have an intelligent debate, not “you’re either with me or agin me”. I do not believe that there is a “Star Chamber”. What I’ve read so far is that it’s far easier to fear the worst – like everything being banned from handlebars to end cans, than have a rational discussion. Do you honestly believe that the European motorcycle manufacturers, American motorcycle manufacturers, Japanese motorcycle manufacturers, aftermarkets motorcycle manufacturers, tyre and component motorcycle manufacturers are not in discussions with the Commission about all these issues? Do you honestly believe that the Commission would deliberately allow a multi-billion Euro industry to go down the toilet? According to Private Frazer, we’re doomed, entombed and marooned and it seems that this logic has now taken hold of some motorcyclists in this country and that’s a shame. The commission like so much of the EU is full of people that intend to ‘make every-bodies life better’ , they may mean to rule well, but make no mistake they mean to rule. The fact we are prepared to use a PTW in preference to a car/bus or whatever make’s us different, an anomaly, like the pistol shooters were in mainland UK, however ‘we’ are far more numerous so they dare not rule by diktat unless they can make us fight each other, scooterists v bikers, cruisers riders v sports riders etc. the pistol shooters were sold out by other shooting discipline’s, how long before PTW riders do the same? I use the term ‘biker’ to cover all PTW riders, as the press and UK gov’t do, if we don’t all hang together… they will surely hang us separately. BTW I can trace my families involvement with PTW’s back to the early 1940’s, and having been brought up on the ideal of freedom, by those that fought for it, riding PTW’s to war and after when private transport was severely restricted. Perhaps that why I feel I see a bigger picture, some of which is clear, but its the (hidden) bit’s that aren’t that really worry me, political correctness demands we are all equal, which we clearly aren’t, some will always be more equal than others. The hidden power lies outside of our scrutiny, all too often in the hands of big business as they can buy influence, yes the commission is the visible ‘face’, but who or what is really driving their agenda? But the response was from the EU Commission, not member state governments and you have to consider that in the Southern European countries everybody uses a scooter or motorcycle – there are over 13 million motorbikes and scooters in Italy alone, so the Commision can’t be anti-two wheeled transport, it doesn’t make sense. I ride a scooter, I don’t want to be a “biker” or would ever consider being in one of these biker groups. It’s not just about you bikers. In fact throughout Europe, there is a far higher proportion of scooters and mopeds than there is motorcycles. What “profile” do “they” think we should fit into? Reward for fuel efficiency has been impossible up to now, because the industry has not identified emissions, so how can you expect governments to give tax breaks if they don’t have point of reference, but under the new regulations the industry will have to declare CO2 emissions. Surely that would be a bonus for PTW users. That the Commission constantly sticks its nose in to create more and more regulations – is an entirely separate matter and that’s what needs attention. Comments like F*ck off EU and they’re out to “get us”, just doesn’t work, infact it just gives the impression that the motorcycling community is awash with conspiracy theorists. We need a rational debate. Hummm, I’m not convinced, a lot of EU gov’t’s hate ‘bikers’ as a group, whatever they they may say, we tend to be independently minded, ask awkward questions and generally exhibit a freedom of thought and action ‘nanny’ doesn’t like. Our diversity is also difficult to manage, we don’t all fit the profile they think we should, and we are not rewarded for being ‘fuel efficient’, my newer injected bike produces ~80gm/km of CO2, if it was a car it’d be tax free, as its 800cc its in the highest tax band, why, if not to ‘keep us in our place’.